Following Operation Desert Storm (ODS) in the Persian Gulf, several field retrofits were made on the Bradley. Referred to as the ODS upgrade, these modifications included an eye-safe carbon dioxide laser rangefinder, a global positioning system with a compass, a combat identification system, a driver's thermal viewer, and a missile countermeasure device. With these changes, the vehicles were designated as the M2A20DS and the M3A20DS. The lessons of Operation Desert Storm combined with the fielding of the fully digitized M1A2 main battle tank clearly indicated the need for an improved version of the Bradley. In Fiscal Year 1995, a development contract was awarded to United Defense Limited Partnership (UDLP) to upgrade the Bradley. 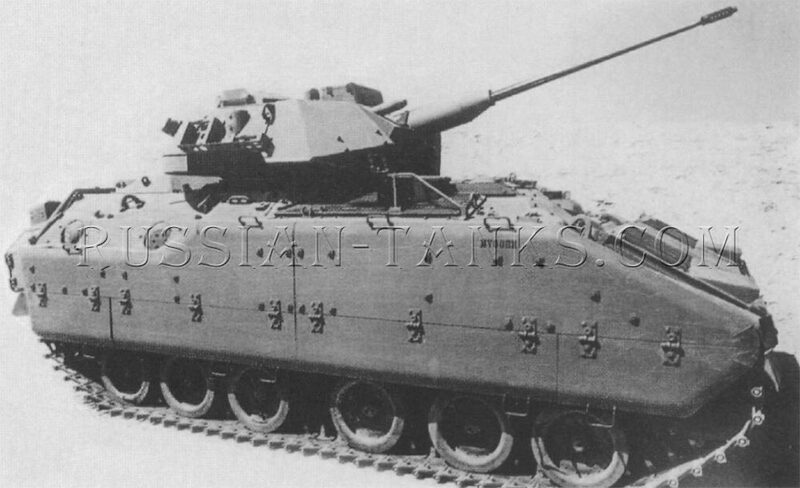 A new vehicle designated as the M2A3 infantry fighting vehicle incorporated a databus, a central processing unit, a mass memory unit, and information displays for the commander, driver, and squad leader. This data system was compatible with the intervehicular information system in the M1A2 tank and the Apache Longbow helicopter. The upgrade included an independent thermal viewer for the vehicle commander permitting the use of hunter-killer tactics. An improved integrated sight unit was installed and it featured automatic dual target tracking, automatic gun target adjustment, and automatic bore sighting. Titanium alloy roof armor provided fragmentation protection. As of late 1996, it was planned to remanufacture 1,602 -A2 vehicles to the -A3 configuration with fielding to begin in 2001. In early 1990, a strap-on prototype of a battlefield laser was tested at Fort Bliss, Texas. 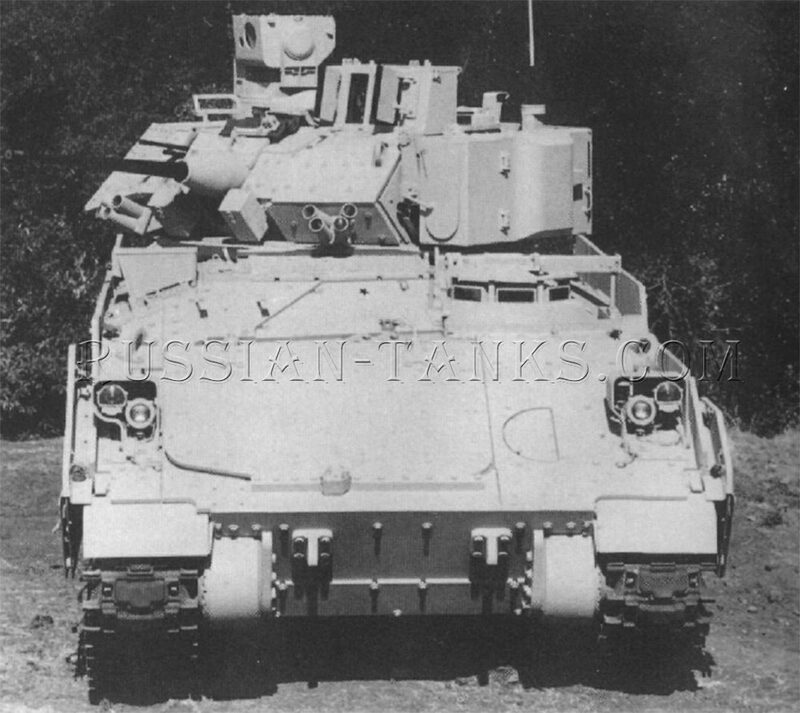 Referred to as the Stingray laser self-protection system, it was intended to blind or disable the optical sights and periscopes of enemy vehicles. Under development by Martin Marietta since 1982, a demonstration version was tested during 1986/87. 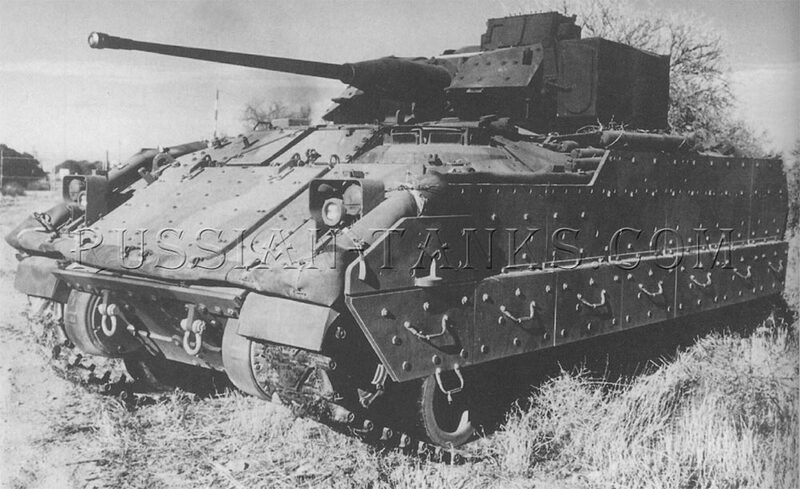 The strap-on prototype was enclosed in an armored housing hinged to the right side of the Bradley turret vehicle. It was equipped with an internal display and a joystick control. The Stingray was under development as part of the U.S. Army Armored Systems Modernization Program. 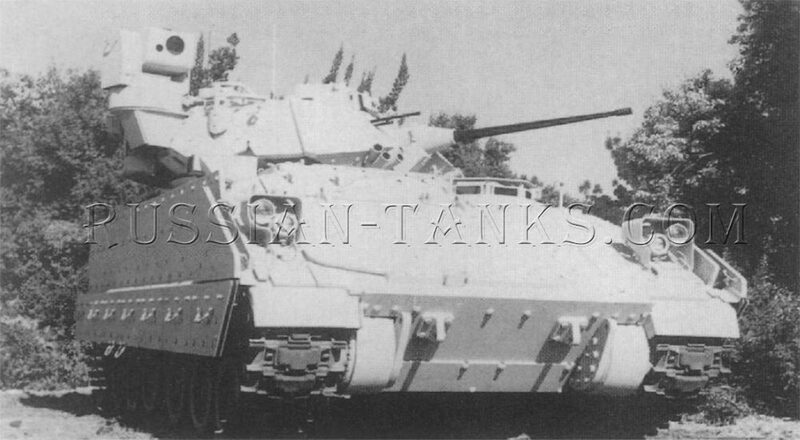 As early as 1981, studies began to upgrade the firepower of the Bradley. Initially, this involved the installation of the 35mm Talon automatic cannon developed by Ares, Incorporated as part of the Eagle air defense system. 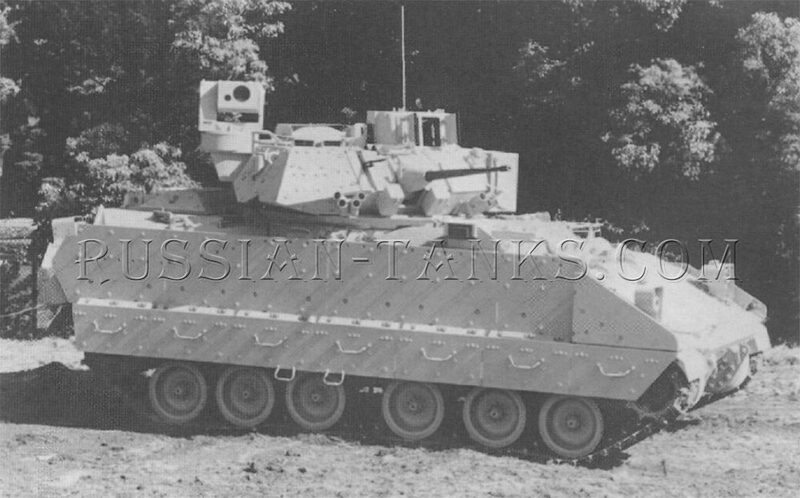 Under the Combat Vehicle Armament System Technology (CVAST) program, the 35mm weapon was installed in a two man cleft turret on the Bradley chassis. Use of the cleft turret minimized the vehicle height and allowed the Bradley with the CVAST turret to be carried in the C130 transport aircraft. 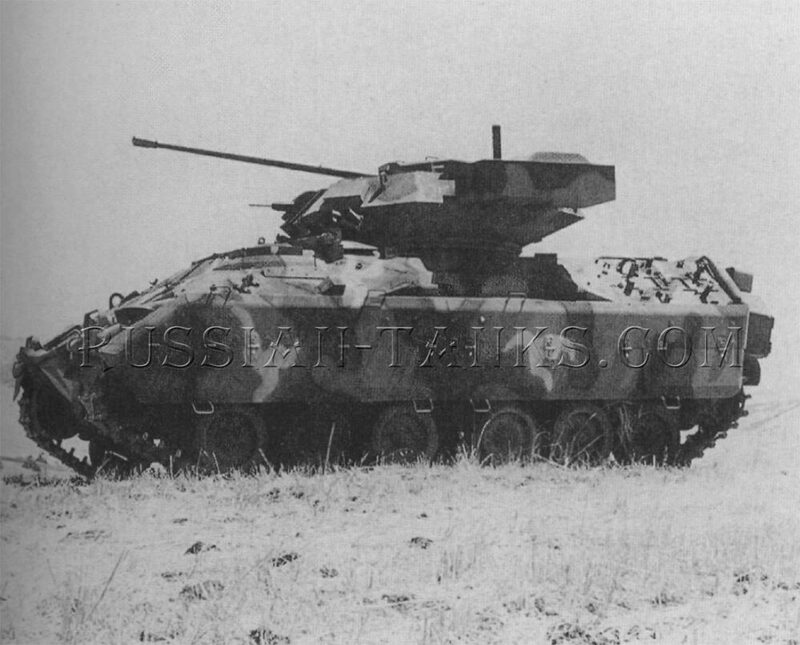 Although the experimental CVAST turret was fired successfully during tests, it did not go into full scale development. Interest had now shifted to the use of case telescoped ammunition (СТА) for the new weapon and the project was now designated as the Combat Vehicle Armament Technology (COMVAT) program. The new telescoped ammunition had the projectile inside a control tube surrounded by the main propellant charge. This complete assembly was inserted into a cylindrical cartridge case. When fired, the primer ignited a booster charge in the base of the control tube forcing the projectile into the bore of the gun. Once the projectile cleared the control tube, the main propellant charge ignited. Use of the cylindrical rounds greatly simplified feeding the ammunition to the gun. With the rotating breech designed by Ares, the ammunition could be fed into the weapon through the hollow trunnions. After each round was fired, the empty case was pushed out as the next round was loaded. 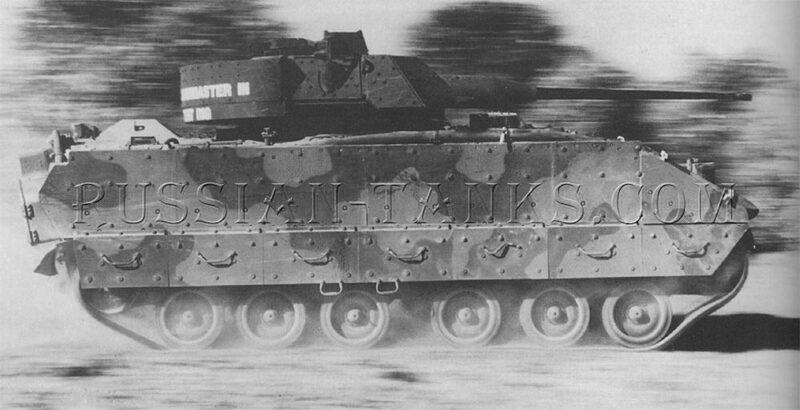 The initial development was for a 30mm weapon, but this was soon changed to a 45mm gun. A two man turret armed with the new 45mm weapon was designed to fit the 60 inch diameter ring on the Bradley. The studies also included an unmanned turret for the same installation. Another approach to improving the firepower of the Bradley was the installation of the 30mm Bushmaster II cannon using GAU-8 ammunition. 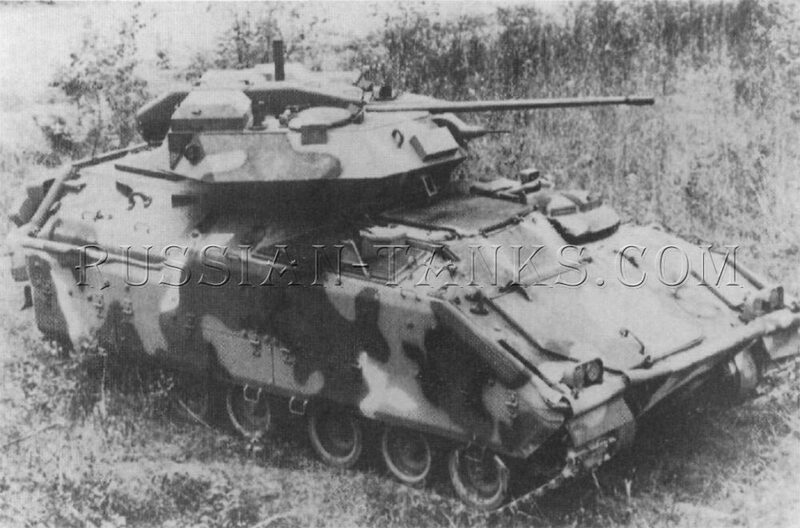 Although the 30mm weapon was 1373/4inches long compared to 108 inches for the 25mm M242, it could be installed in the standard Bradley turret vehicle with very little modification. The Bush-master II weighed 325 pounds compared to 244 pounds for the 25mm weapon. With the armor piercing round, the muzzle velocity of the 30mm cannon was about 4,000 feet per second. In addition to the Bushmaster II, a 35mm Bushmaster III and a 40mm Bushmaster IV were under development. A 50mm barrel also was under development for installation on the Bushmaster III permitting it to fire an APFSDS round referred to as the 50mm Supershot. 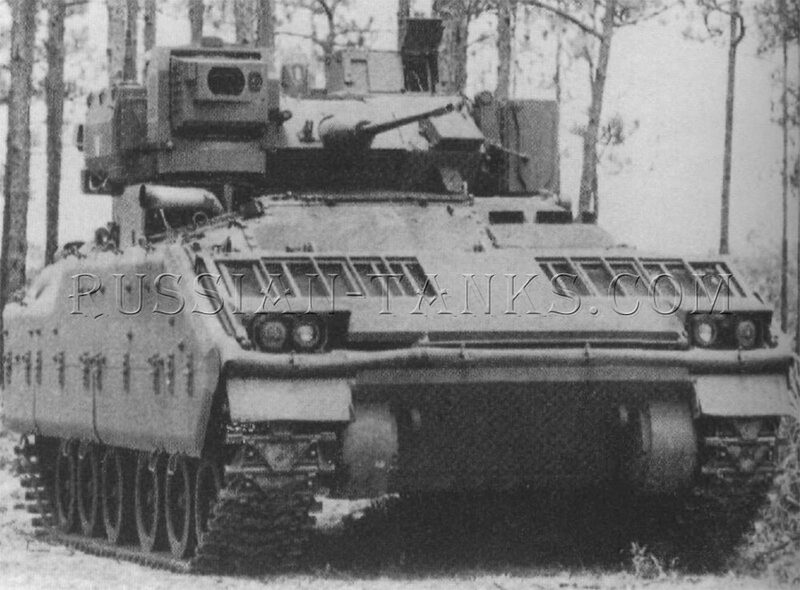 The 35mm Bushmaster III was installed in the Bradley turret vehicle for evaluation.